Another new year has begun. As 2019 starts, I would like to take this opportunity to thank you all for your warm support that enabled our wide range of fulfilling work over the past twelve months. We kicked off 2018 with the “Evolution” Europe Tour, then visited our 50th country to date: Egypt. In Japan, Kodo toured nationwide with “Michi,” performed at NHK Hall in a new collaboration with vocaloid Hatsune Miku, and fired up the main stage on Day 3 of Fuji Rock Festival ’18. One of the year’s highlights was performing live music for new Kabuki work “Yugen” starring Tamasaburo Bando at Tokyo’s iconic Kabukiza Theatre. This month-long experience was a precious opportunity for us all. 2018 also marked a noticeable shift towards younger Kodo performers taking the creative reigns. We saw the directorial debut of Yuta Sumiyoshi with “MEGURU,” which premiered in November. Its inaugural tour in Japan ended on a high note with five days of concerts in Tokyo at Bunkyo Civic Hall. “Kodo Next Generation,” directed by Ryotaro Leo Ikenaga, ventured abroad for the first time for a summer series at Theatre du Soleil in Paris, France. 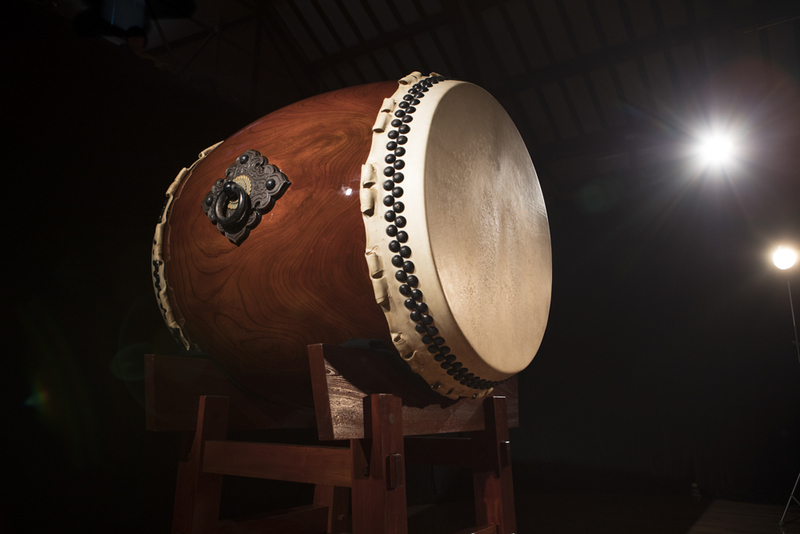 Back at home, new School Workshop Performance and Kodo Interactive Performance programmes directed by Jun Jidai delighted school children and general audiences nationwide. 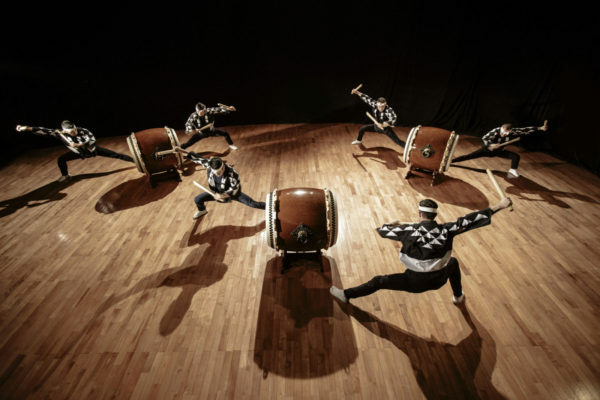 These new directors from within the Kodo ensemble showed us dynamic power and their own unique flair, leaving us with a sense of Kodo’s future in their capable hands. At the end of 2018, we all came together to celebrate the 50th anniversary of Kodo’s Yoshikazu Fujimoto’s taiko performance career with commemorative concert “Taiko Warabe Gojunen.” I was deeply moved on this special occasion, where I am sure we all felt the magnitude of Yoshikazu’s history firsthand, reinforced by guest performances by Iwasaki Onikenbai and Wachi Daiko Hozonkai that reminded us of the power and splendor of performing arts. In 2019, we plan to enrich not only our performance activities but also to pour more energy into workshops. We’re also going to be creating and sharing new music and focusing on fostering broader, deeper activities that bring our group closer to our audiences. 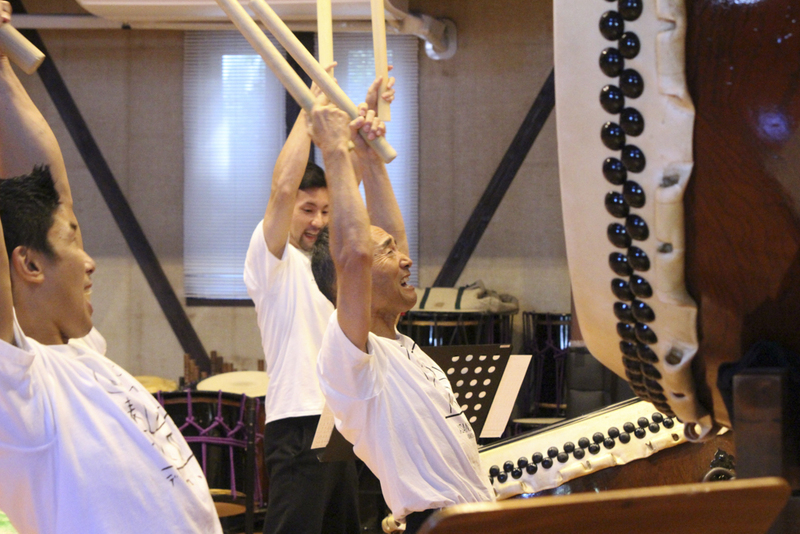 We are working on new initiatives that we hope will bring even more people to theaters to enjoy taiko with Kodo. 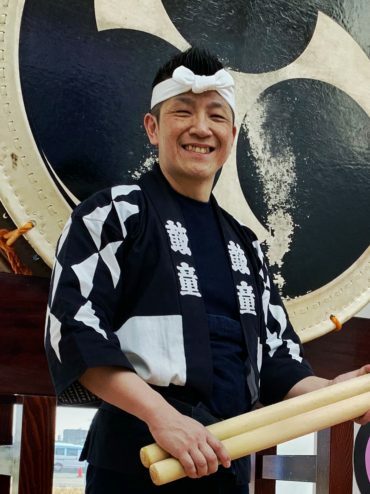 Kodo remains dedicated to our dear home of Sado Island, one of the reasons we are passionate about our annual, deep-rooted local events Earth Celebration and the Kodo Sado Island Performances in Shukunegi. I hope we can expand our activities on Sado to include more tour productions, school performances, and workshops. We always craft sound and rehearse at Kodo Village before setting off on tour: Sado Island is where each journey starts for Kodo. This year I want us all to hold a renewed awareness of that fact. 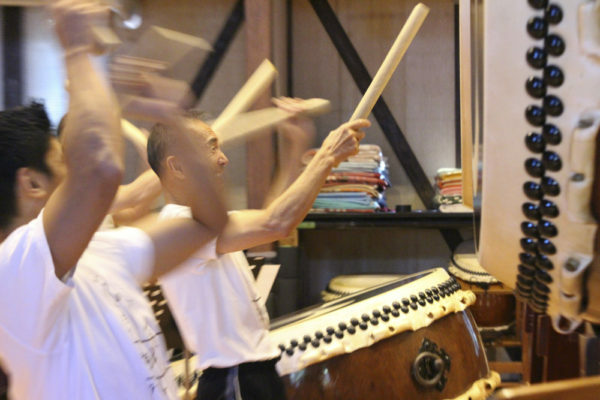 Of course, you could say the real starting point for each Kodo performer is our apprentice Centre on Sado. It’s an precious environment where each individual has their eye on one main goal, training alongside their comrades, living an intense, communal lifestyle. This year, I want us each to think about our time at Kodo Apprentice Centre and reflect on the unique experiences we all had there, which were only possible by living and training at this marvellous place. I want us to share our experiences far and wide through increased exchange, both face to face and via social media. None of our diverse activities leads us down the easiest path. I want us to keep tackling each challenge carefully and sincerely as we seek even better sound and create performances brimming with joy. I sincerely hope that this year will be another great year for you all. I kindly ask for your continued support and encouragement throughout 2019. As you probably already know, Kodo’s last performance this year will be “Taiko Warabe Goju-nen,” a special concert commemorating Yoshikazu Fujimoto‘s 50th milestone year as a performer. 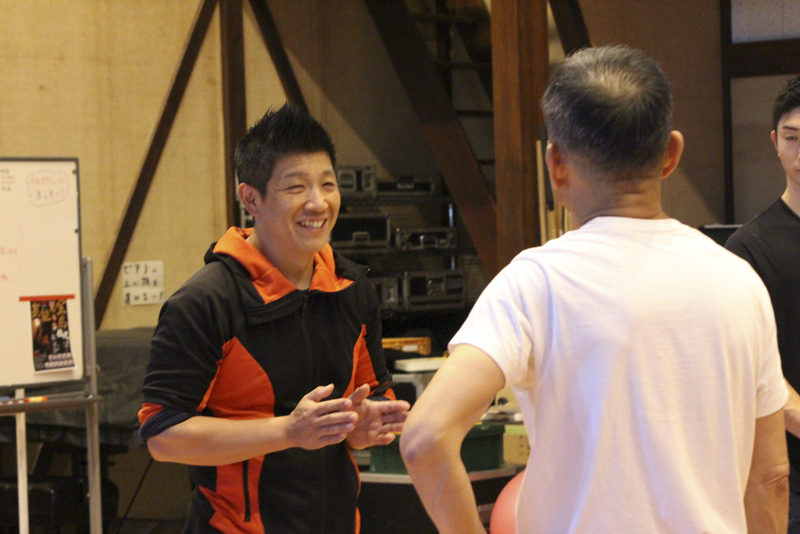 The other day, we had rehearsals at Kodo Village and Yoshikazu showed all the junior members (which in this case means everyone!) his body and soul approach in practice. When I heard him say that, I felt the weight of those fifty years in his embodiment of those words. 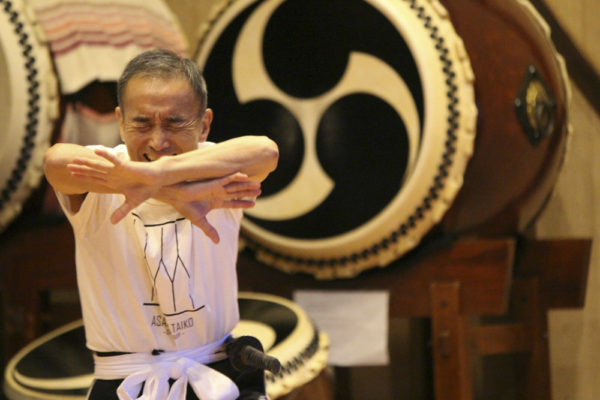 For this performance, we will welcome Iwasaki Onikenbai Hozonkai (Iwasaki Demon Sword Dance Preservation Society), who have taught Yoshikazu Fujimoto and Kodo for many years, and Wachi Daiko Hozonkai (Wachi Taiko Preservation Society) from Yoshikazu’s hometown, Wachi, where his taiko journey began. Kodo will be there right alongside these special guests and Yoshikazu, giving our all to celebrate our most senior member. I am really looking forward to this performance! 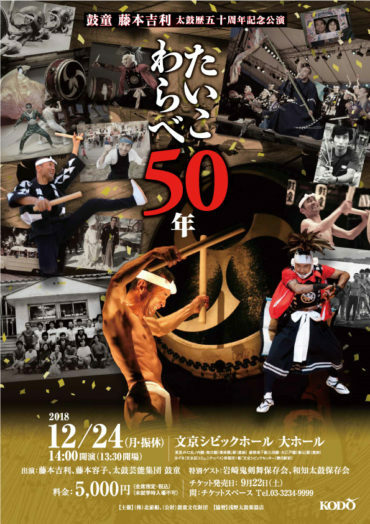 Kodo’s latest production MEGURU will be on stage at Bunkyo Civic Hall until Dec. 23, the day before “Taiko Warabe Goju-nen” on Christmas Eve. 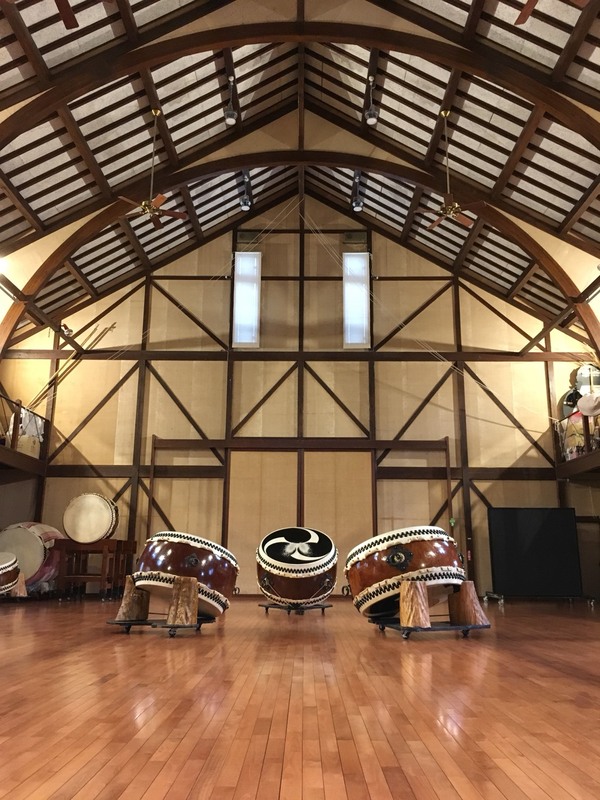 I really hope you’ll take this opportunity to see Kodo’s depth and breadth as an ensemble through both of these distinct concert programs. 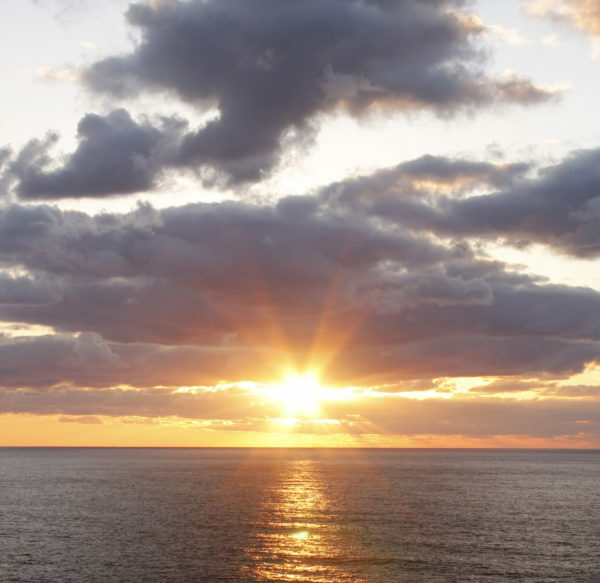 Today marks seven years since the Tohoku Pacific Earthquake & Tsunami. I would like to offer my sincere sympathy once more to all the people who were affected by this disaster. While this day will remind them of many things, I pray that they will also find peace. It’s a quiet Sunday at the Kodo Village rehearsal hall. I will take a moment of silence at 2:46pm to remember Tohoku.